After the Coyote women christened the Sanford Coyote Sports Center with a win over Stephen F. Austin, the Coyote men followed suit defeating Bowling Green 78-72. For USD, to get a win in their new home felt like it was a long time coming. “The guys have been talking about it since they’ve been here and since they’ve committed, like we’ve got to get this done right and build a tremendous home court advantage at the SCSC,” said Coyote head coach Craig Smith. The new building is a point of pride for the Coyotes and they wanted to start off strong in the SCSC. Two days after they opened their season with a 79-74 win over Drake, the Coyotes returned home to open the SCSC. The first half was back and forth before the Coyotes found some slight separation thanks to five straight points from junior guard Trey Dickerson. USD entered halftime with a 33-27 lead over the Falcons. The Coyotes came out strong in the second half, jumping out to a 42-29 lead. From there Bowling Green gained ground, as the Falcons found their rhythm and took the lead with around eight minutes to play. Bowling Green would maintain the lead until two tough shots from sophomore guard Matt Mooney put the Coyotes back in control with two minutes remaining. From there clutch free throws from freshman guard Triston Simpson and good rebounding would seal the game for the Coyotes as they went on to win 78-72. The Coyotes struggled down the stretch and nearly let the game slip away, but they showed poise to battle back and secure the win. One thing that helped the Coyotes down the stretch was the presence of a strong home crowd. Burch-Manning was the Coyotes’ leading scorer, rebounder and assist man with 14 points, 11 boards and three assists. 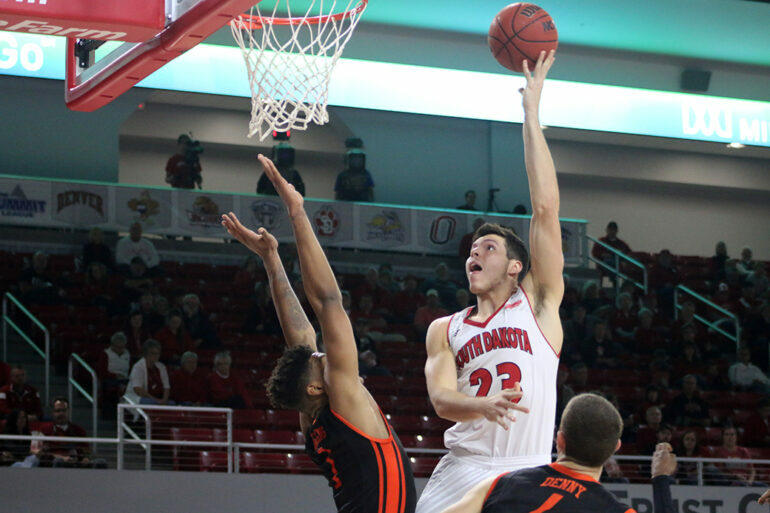 Senior forward Tyler Flack scored 12 and was big for USD on the defensive end with six blocks. Hurst notched 13 points and pulled down five rebounds, he was a factor for USD late coming up with a key block and rebound to help lock up a Coyote win. Burch-Manning’s efforts earned him Summit League Player of the Week for his performance against Bowling Green, along with his 24 point, 11 rebound outing against Drake. That bench is sure to be a go to for the Coyotes this season. With 10 new players suiting up for USD, there will definitely be some experimenting with the lineup. The Coyotes are now 2-0 on the season and will play again on Wednesday night when they take on Presentation College in the SCSC at 7 p.m. USD follows up Presentation with another game in the SCSC on Thursday against Doane University at 7 p.m. That is the opening game of the Gulf Coast Showcase, the following games take place in Estero, Florida.